Howzat! 47.3% is Nine’s biggest TV share since 2012. Australia’s victory in the ICC Cricket World Cup scored the biggest single audience on television so far this year at 2.22m viewers for Session 2. It has eclipsed the Australian Open‘s 1.88m viewers and individual episodes of My Kitchen Rules (1.78m). There were 856,000 watching in Melbourne and 723,000 in Sydney. Nine claims the Preliminary figure will rise to 2.4m viewers which will place it as the highest rated cricket game since the start of OzTAM in 2001. With Regional viewers will climb to 3.29m. It was just the shot in the arm Free to Air needs as it battles alternative entertainment forms. Proving Live Sport is TV’s biggest drawcard there was also a whopping 522,000 watching the same event on Pay TV. Session 1 scored 1.89m for Nine while Nine News had its biggest audience of the year at 1.96m viewers. Nine obliterated the competition with a staggering 47.3% share -its biggest audience share since August 2012. It was more than twice the share of Seven on 21.3%, and three times the audience of ABC 13.4% and TEN 12.7% while SBS had to settle for a 5.2% share. But the disappointing news for Nine is that the numbers will not factor into the TV ratings year, with this week and next both out of survey across Easter. As a result Seven chose to hold off key programming, screening Seven News (876,000), Sunday Night (810,000) and Border Patrol (558,000). ABC News (574,000) and Broadchurch (568,000) were best for ABC. TEN’s strongest remains Shark Tank (587,000) then Modern Family (490,000 / 400,000) and SBS ONE’s best was Last Days in Vietnam (238,000). OzTAM Overnights: Sunday 29 March 2015. Always amuses me when people like MHA and DeeCee talk about blurry vision when viewing sport in SD. On my good quality Pioneer Plasma TV the picture for the cricket was not blurry at all on 9, but I must admit that when the cricket switched over to GEM, whilst 9 went to the news (in Qld. ), the picture was exceptional in HD. 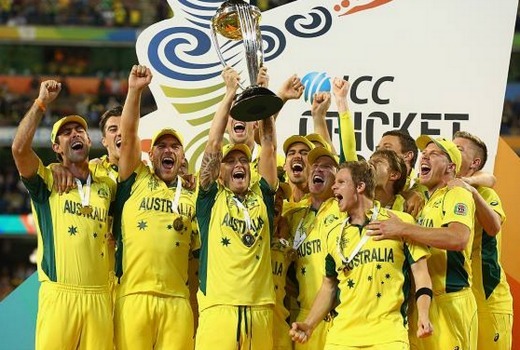 A great win for Australia in the cricket. Thankfully I have foxtel though. I flicked over to ch9 and it must be said the picture quality was barely standard definition. there should be a new term – SSD for sub-standard definition. If only Nine ran it in HD instead of the blurry mess that is SD? When ‘o when will all the FTA networks resume a main channel HD service! Arguably the figures for Nine might have been higher if Nine screened in both HD and SD instead forcing those who wanted to view in HD switching to Pay TV. Why was the Malaysian Grand Prix not screened live last night. I am not usually a football or cricket watcher, I did not watch all of the Cricket but switched over a few times through ads on Shark Tank but I stayed on TEN all night as I do on Tuesday and Wednesday nights. This week may see a change as normal programmes are not on. TEN were never going to show all Grands Prix live. It may have been streamed on tenplay however? Network Ten will broadcast 10 Formula 1® races in 2015 in simulcast with FOX Sports. FOX Sports will also show another 10 Formula 1® races, with Network Ten broadcasting a 60-minute highlights program of each of those races on ONE at 9.30pm on the Monday night following the event. Those on Channel 9 watched the blurry version whereas those on Fox Sports watched the clear version.